Monday July 20th 1891 It was a fine day to do the big washing and we got some of the ironing done. Ann sewed some for me. Jennie Woolf came after dinner and the girls went to town with her. I sewed all afternoon. Will and I drove over town after supper. Tuesday July 21st 1891 It looked very much like a rainy day but was only a slight rain. The girls went over to Esthers for a few days visit. I finished the ironing this morning and then sewed the most of the day. Mother done the work. Wednesday July 22nd 1891 There was a very hard rain early this morning and it continued most of the forenoon. Lee came home before noon and went back tonight. Mother went to town with him in the afternoon. I was sewing all day. Thursday July 23rd 1891 I walked to town in the morning and done some shopping and went to the dentists. I rode home it Otts buggy for Mother and Father to go to the valley. I was sewing all the time I could get from the work. This has been my birthday. I am 40 years old. 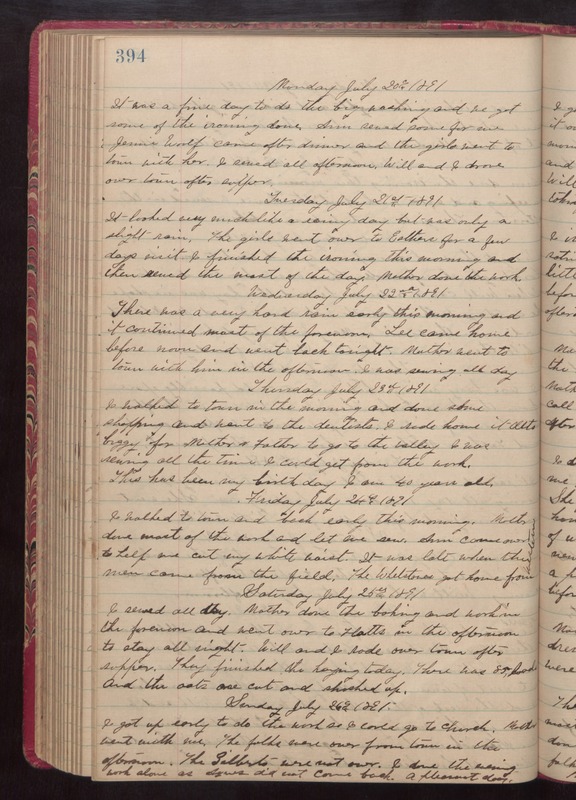 Friday July 24th 1891 I walked to town and back early this morning. Mother done most of the work and let me sew. Ann come over to help me cut my white waist. It was late when the men came from the field. The Whetstones got home from Western. Saturday July 26th 1891 I sewed all day. Mother done the baking and work in the forenoon and went over to Hatts in the afternoon to stay all night. Will and I rode over town after supper. They finished the haying today. There was 85 loads and the oats are cut and shocked up. Sunday July 26th 1891 I got up early to do the work so I could go to church. Mother went with me. The folks were over from town in the afternoon. The Gilberts were not over. I done the evening work alone as Agnes did not come back. A pleasant day.